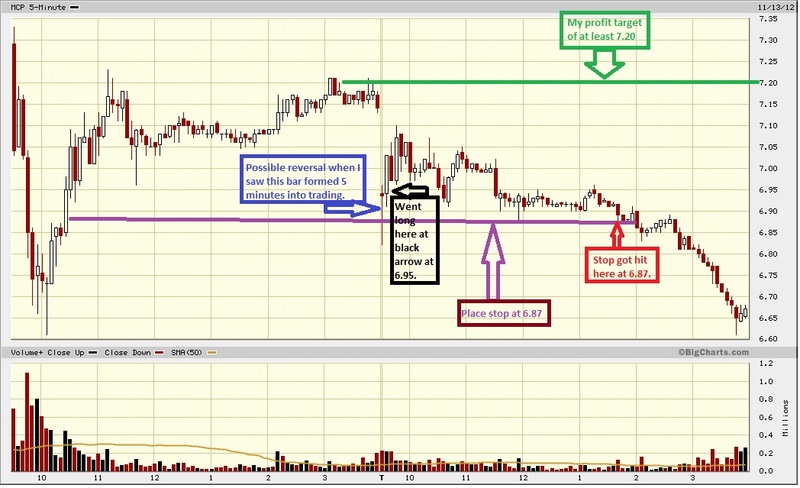 TRADER 9: Trade of the day, MCP!!! I missed out on some nice bounce plays I was considering today because I got into a social media pump fest with some of my followers with VRNG. I usually play 3-5 Dead Cat Bounces a day but the only one I got into was MCP, which ended up taking a very slow nosedive. Bought 1000 shares at 6.95 hoping it will at least fill the gap from yesterday's closing price plus a little more. It might have been a little too much wishful thinking on my part since MCP is under a SEC investigation. When an investigation is going on with any traded company, shorts are not going to cover anytime soon, and buyers are staying very far away from them. Ended up getting stopped-out at 6.87 for a .08 point loss. Tomorrow is another day. Why didn't you put your stop at the lows of the day of around 6.80? I usually do, but I figured that with the market selling off and the SEC investigation if it broke through 6.87 that it wasn't going to bounce at all. And look, I was right.